With Free and Wild Canadians Iron Dogs may have created a perfect example what can be called both thrashy and trashy NWOBHM album. Mixing the aforementioned NWOBHM, as well as something Accept would have been proud of melodically, Germanic thrash and heaps of Motorhead attitudes, Free and Wild is impossible not to enjoy it is so catchy and rocking. Beginning with the awesome opener Firebird, all one has to do with Free and Wild is to gulp and relish it in one quick sitting. With harmonies being a touch sloppy (on purpose? ), Iron Dogs present brash guitar acrobatics with hooks difficult to avoid they are sinking so deep. Awesome leads (Firebird), arpeggios and polka beat bridges (title track), these songs come, frenzy whip a storm, subside momentarily, only to roll back again. A few of them are a little slower, like the naiveté infused, early Judas Priest inspired Kingdom of Steel and fist-pumping, anthemic, full of fighting spirit Storm Warning. Yet it seems that Iron Dogs revel and are most comfortable when they become totally unhinged, as in the beginning of the title track and throughout the closer Island of the Dead. What Accept probably would not have back in the days are the dense, high in the mix drum beats. In the case of Cannibal Death Cult, this translates in the constant double bass, burying some excellent melodies under it. Not a raspy Udo, but Iron Dogs could care less how Jo Capitalicide hits his notes. Being vocally off key on Free and Wild actually has its charm. On the choruses he sometimes has “help” from the gang, which makes the whole thing sound totally demented on rhythmically less straightforward Adversity or Island of the Dead. And once in a while (Adversity) he is stoned out of his mind, bringing forth some comparisons with Mike Skalzi, making Iron Dogs sound a little like less polished Slough Feg, something they should take as a huge compliment. 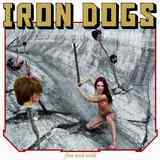 In the day when retro metal is actually rather popular, Iron Dogs hit high marks with their version of it. Besides, the band is pitching a pretty wide tent, as Free and Wild should appeal to punk aficionados (Toxic Holocaust fans need to check this out), modern rebels of all ilk and old dudes like me whose reminiscences are rewarded throughout this 30 min ride.